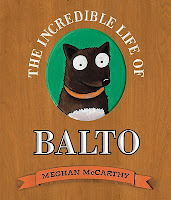 The Incredible Life of Balto by Meghan McCarthy. Grades K-5. Alfred A. Knopf, 2011. Unpaged. Review copy provided by my local library. I have been fascinated by the story of Balto and the 1925 race to get medicine to the children of Nome, Alaska, since I saw that Disney movie. I have also long been a fan of Meghan McCarthy's picture books (see my reviews of Pop! and Strong Man). So, for me this book was a perfect match! The first half of The Incredible Life of Balto tells the story we already know: sick people in Nome, lots of snow in Alaksa, dogs save the day! The second half goes on to tell the rest of Balto's story. At first, Balto was super famous, starring in a movie and having dog food named after him. But all too quickly, Balto's fame seemed to dissipate as the dog team was sold and sold again. When a kind businessman, George Kimble, saw Balto in a sideshow and wanted to save him, the owners charged more money than he could afford. He turned to the Cleveland community and many people donated money to help save the dogs. The Incredible Life of Balto has classroom applications on many levels. This would be a great book to start discussions on community and teamwork. Not only do the dogs (and mushers) work together to get the medicine to Nome, but the entire community of Cleveland works together to purchase Balto and give him a nice home. 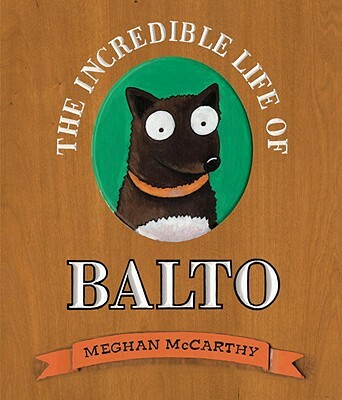 In an extensive author's note, Ms. McCarthy writes about being a history detective and tracking down the details of Balto's story when various historical accounts had conflicting details. It took an incredible amount of research just to figure out what color she should paint Balto in the pictures (brown or black?). Included with the back matter are some activities and tips related to researching nonfiction and reporting on events. Pair this book with Ain't Nothing But a Man: My Quest to Find the Real John Henry by Scott Reynolds Nelson for a discussion about historical research. Yes, this book has many classroom applications, but it's also just a fun story. Not only is it about a DOG but Meghan McCarthy's trademark bright colors and cartoon-style illustrations are sure to catch the eye of kids. Balto goes through some tough times, but he has a happy ending and Ms. McCarthy features the fact that kids contributed their pennies and school classes collected money to help save Balto. Check out more reviews at A Fuse #8 Production and The Nonfiction Detectives. The Incredible Life of Balto is on shelves now!